If you are anything like me, you spend far too much time sitting in front of a computer looking at all things related to woodworking. I love looking at images and videos of woodworkers workshops and am often struck with an awe (and envy) when I see what people have built in their workshops. More often than not, at the center of these workshops, there is some type of a table saw, but it never seems to just sit there on it’s own. It will be accompanied by some amazingly designed piece of workshop furniture with the purpose of enhancing the use of the tool. And on top of this I don’t think I have ever seen two the same. One of the great things about woodworkers, is that we don’t just copy something that we see is cool, we are happy to take features that work for us and adapt others that don’t. 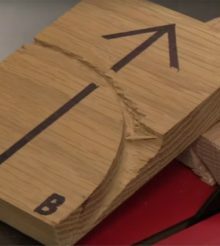 You can see this when looking at table saw outfeed tables. Some are designed with space saving in mind. Some are designed to accommodate large sheet goods, some are designed to incorporate router tables and some are designed to double as assembly tables, I could go on. I wanted to share some of the best table saw outfeed tables that I’ve found. I found this one over at woodworkingtalk.com This was posted by the user Lola Ranch. Its a good size workshop where he needs two table saws. 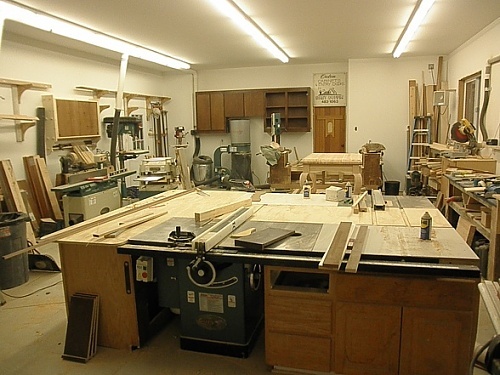 The way he has set up his table saw station that both table saw’s share the same table. This mobile workstation from Elton Hammond not only increases the capacity of the saw but also looks really good as well. It’s interesting to see this sort of thing attempted with a large cabinet style saw. One of the big challenges was to keep table height low enough but still up on casters. With the large custom fence and rail and inbuilt router table means you are able to do so much more. This outfeed table is from user Tkuzma over at LumberJocks.com. His Maple, ply and MDF workbench doubles as the outfeed table for his table saw. Being on levelling wheels means he can reposition and adjust the height quickly and easily. When he doesn’t need to use the table saw, he can roll it away and so he is able to move all around the table. I found this one on the inhabitat website. It’s very simple in its design. 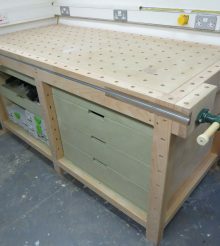 It incorporates a small extension that mounts to the same mobile base of the cabinet saw and is also levelled to the same height as the enormous assemble table. This is another one I found at lumberjocks.com. It has a huge rip capacity and plenty of storage. This table saw station from Andrew Betschman over at LumberJocks.com is a great example of how to increase the capacity of a small portable table saw. I found this outfeed table over at ccbanta.com. It has a great width and depth and makes really efficient use of space for storage. I really like the power outlets that can be used for small power tools. Todd Fratzel has built his simple and effective table saw outfeed table for his Delta Unisaw that also doubles as an assembly table. 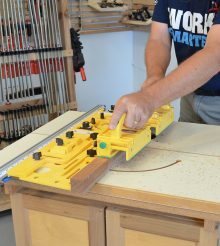 The T-Track on the table is used for adding hold downs to clamp jigs and workpieces. Has simple and effective storage for small power tools and jigs. This is a great example that shows woodworkers can spend as much care and attention on their workshop furniture as they do on the projects that they make. This mobile table saw station from zzzzdoc on LumberJocks.com is based around the SawStop contractor saw. To the right of the saw there is a router table extension which uses an Incra Wonder Fence.